After five years of trying, Fonterra have won the battle of the corporates in Southland, with regard to track cycling. 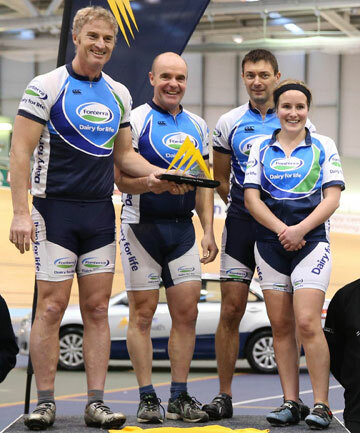 The Fonterra 1 team won the popular annual corporate team pursuit event yesterday, held at the SIT Zero Fees Velodrome in Invercargill. Fonterra beat SBS in a tight final, which put them in the top spot out of the 22 teams taking part. The Fonterra team was made up of Phillipa Swain, Jeff Rooney, Ian Wright, who are all tanker drivers at Fonterra, and Craig Fleming, who is an electrician. Wright and Rooney know a thing or two about turning the pedals over on a bike, although they have been more used to longer distance racing over tough terrain than what they experienced yesterday. They both compete in 24-hour mountainbike racing but do enjoy the switch to the short-distance racing on the track. "It is the totally opposite end of the scale isn't it?" Wright said after the win. Fonterra have had teams take part in the event for the past five years and for Wright personally it was his fourth year competing. "It's great to be winning it after trying for three or four years now," he said. The event is organised by Cycling Southland. It is a handy fundraiser for the organisation and provides novice cyclists with an ideal chance to use the velodrome. Cycling Southland have also picked up some riders from the event over the eight years, with some opting to stay involved with the sport. Speedy Radcliffe and Urology Now entered teams for the first time this year, with Urology Now taking out the division two honours. Crowe Horwath are the major sponsors of what has been described as the largest world corporate track cycling event.